Mobile is set to be the number one video screen in the UK, leading to a predicted increase in mobile ad spend in 2017, according to new research. The global piece of research from AOL is released just ahead of Mobile World Congress 2017, was conducted in seven markets including the UK and analysed consumer behaviour as well as publisher and advertiser opinion. Smartphones are rivalling desktops as the screen of choice for video, with an average of 57% of consumers globally watching videos on their mobile phones every day, compared with 58% who watch videos on their desktops or laptops. In the UK, nearly three-quarters (71%) of consumers say they can’t live without their smartphone or always have to have it within arm’s reach. With dependency on smartphones on the rise, 54% of those surveyed say they are watching more online video now than a year ago, and 52% are watching these videos on their smartphones daily – the same amount as those watching video on their desktops or laptops (52%). With so many distractions at our fingertips, the attention spans of online consumers are rapidly shrinking. While online video is growing across all lengths, consumption of short-form video is rising at an even higher rate. In the UK, 32% of consumers watch videos that are five minutes or less every day (vs. 42% globally). As videos get longer, this number decreases, with only 17% of consumers watching videos that are 10-20 minutes long on a daily basis (vs. 21% globally). In the UK, 60% of consumers are regularly watching live video content on their smartphones, compared to 66% globally. Of those who are watching 360-degree video in the UK, 38% are experiencing it on their smartphones. And when it comes to VR, just under a third (29%) of those who experience it do so on their smartphones. Compared to the rest of the world, the UK is still slow on the VR uptake. 31% of US consumers and 21% of Southeast Asia consumers are expected to watch more videos in VR in the next 12 months, compared to only 9% of UK consumers. The industry is set to keep up with consumer demands this year. In the UK, nearly half (46%) of advertisers are expected to increase mobile ad spend by at least 25% (vs. 47% globally). On the other side of the coin, 61% of publishers are expecting client investments in mobile video to increase by at least 25% this year (vs. 57% globally). AOL’s study has identified the three biggest opportunities for mobile video in the UK in 2017. When asked what they were most excited about in the development of mobile video, 42% of advertisers and publishers cited granular audience targeting, followed by videos under one minute (38%) and TV to mobile retargeting (37%). With these opportunities, advertisers are shifting more money away from TV budgets. When asked about the channels their TV budgets were shifting to, 61% of UK advertisers stated mobile video. 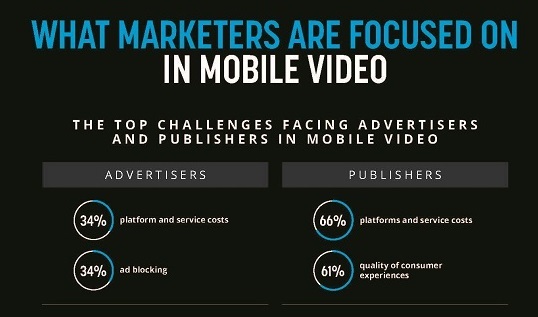 As mobile continues to grow, there are still a number of key challenges facing the industry. Platform and service costs are the biggest bugbear, with 34% of advertisers and nearly double the number of publishers (66%) citing this as their top barrier. Ad blocking also continues to be a concern for 34% of advertisers, with publishers also stating the quality of the consumer experience (61%) as a major obstacle. In response to this, solving long load times is a key priority for publishers in 2017. 40% of advertisers are spending less on mobile video ads due to long load times and 38% are combatting the issue by creating lighter ads that can load faster. But far from resting on their laurels, 91% of publishers surveyed said they are either exploring possible solutions or have already implemented new solutions to create a better user experience. AOL Commissioned InsightsNow to conduct two surveys the first was among 1,600 buyers and sellers who were involved in media decision making and the second was 1,300 consumers age 13-54. The research was conducted in 7 markets (US, UK, Canada, France, Japan, South East Asia, Australia) during the Autumn of 2016.